It’s finally October! October means two things: 1.) Pumpkin season has begun in earnest and 2.) I will not apologize or hide my pumpkin obsession any longer. Everyone makes fun of pumpkin spice, but you know what? Millions of people can’t be wrong. Pumpkin spice lattes might be a clever marketing ploy, but I’m down with pumpkin and I’m down with spice. Pumpkin is one of those weird things, I find. Some people love it, some people hate it. I’m a pumpkin lover, through and through. I’m pretty sure it’s because my mom never let me eat pumpkin pie when I was a kid. We’d be walking by the bakery and I’d smell the most amazing smell and I’d ask her if we could buy it and she’d get me a doughnut or a cookie. While the treats were tasty, even my four-year-old mind knew that they weren’t the deliciousness I was smelling. No, my childhood was pumpkin pie-less. When I finally got a piece of the elusive pie, I went a little crazy. I love pumpkin pie, pumpkin doughnuts, pumpkin pancakes, pumpkin french toast, pumpkin noodles, pumpkin mac and cheese – essentially, I like pumpkin in anything and everything. I especially love wrapping my hands around a pumpkin spice latte. 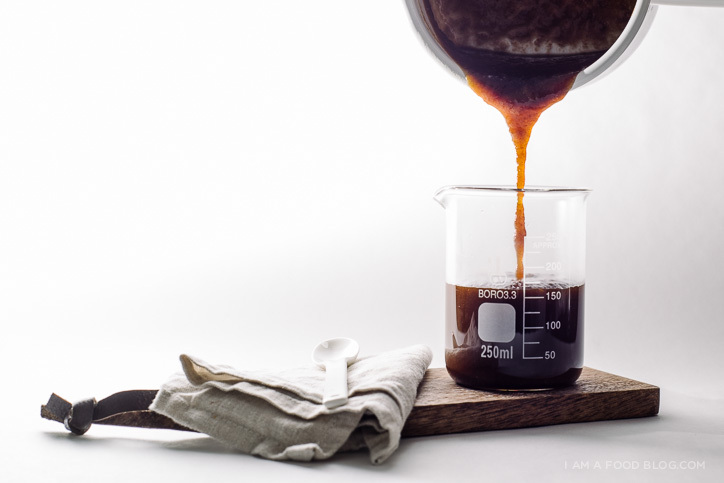 Last week, when it finally officially became fall, I whipped up a quick batch of pumpkin spice syrup and used most of it in my morning pour-over. I’m kind of obsessed with pour-over coffee (I love the ritual) and even though it’s blasphemous to drink pour-over anything other than black, I went ahead anyway and it was heavenly. I even whipped up some heavy cream by hand and topped it off with a (not-so) healthy dollop. It’s spicy, fall heaven in a cup. Sweater-weather here I come. Happy October! In a small saucepan, combine the water and sugars. Bring to a boil over medium-high heat and stir to dissolve. Turn the heat down to low and stir in the spices and pumpkin. Simmer (without bringing to a boil) for 5 minutes. Let cool and store in the fridge or use immediately. Stir together the milk, espresso and syrup. Taste and adjust if needed. 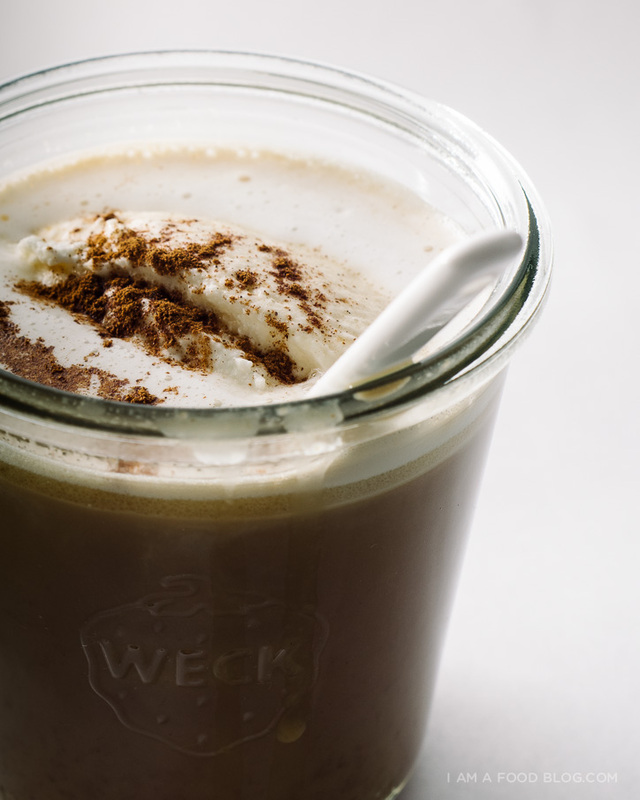 Top with whipped cream and cinnamon, if using and enjoy hot. Alternatively, if I’m drinking drip or pour over coffee, I just add the syrup and milk/cream to my mug to taste. I only discovered the deliciousness of Pumpkin when I was well into my late teens. I have a lot of catching up to do! Gorgeous recipe and of course pictures and (GIF) too! Haha, I am the same as Belinda. Lots of catching up to do! I have never had a pumpkin spice latte, so I cannot wait for this! YESSSSS PSL twins FOREVER!! <3 <3 <3 <3 (Also, I second your pour-over love, too! Especially since we have about … 2 square feet of countertop space and the rice cooker gets prime real estate. Thank you, tiny Hario.) xoxo!! I usually just follow the lazy route and put pumpkin puree into a blender with coffee and milk… Which would be not the pour-over way at all and would infuriate coffee snobs. So I guess I’m not contributing much to this discussion, except that is to say I do like the pumpkiny rawness the puree preserves over the syrup. I also had a pumpkin pie-deprived childhood… so guess what happened when I was home alone after school one day, and saw a recipe for pumpkin pie on the back of a can of carnation condensed milk? I found some leftover squash purée in the fridge, and got to work. And then I ate it ALL. To this day my mom never knew what happened to the missing ingredients. I love this!! I was thinking these days what a shame it is that I never tried a pumpkin latte when I was in the States. I hate sugary drinks, but I would have liked to try a pumpkin something. Guess that it’s less scary to make it at home? What if I sub part of the regular sugar with dark sugar? you could totally sub the sugar out for dark and even dial it down a bit – totally customizable! You don’t have to apologize for loving pumpkin to me. I understand. I am not sure why it’s just for fall and early winter time, but I guess it’s to increase how special it is by limiting it. Like only have evergreen trees in your living room at Xmas time. Anyway love the spice mix. Yum, this looks so good and comforting in the colder weather! I love that its time for all the pumpkin recipes to start coming out again, as its so hard to get canned pumpkin in the UK. we have to wait till fall for the harvest to come out and its a shame – i adore it! This is easy enough. I might have to try this out! The weather is going in the absolute opposite direction on this side of the world, but I’m all for pumpkin ALL YEAR ROUND please! PSLs with REAL pumpkin? Finally. P.s. I love that gif. P.s.s. Never apologize for a pumpkin obsession. When you say canned pumpkin- are you adding whole cubes or mashed up? Can one roast the pumpkin, mash it up and add to the mixture- especially if canned pumpkins are not available in one’s region? yes, you could do exactly that – roast and mash! I knew there was a reason I liked you, Hands up for pumpkin. Susan is making pumpkin scones for our guests this weekend! Look yummy… What type of coffee maker is that? Aw man that looks incredible! I am drooling over that gif. Need. Coffee. Now. Or maybe just a PSL. AND homemade? Yesss. Thanks for sharing this great recipe! Made a perfect cup of pumpkin spice chai latte! I really loved this recipe! 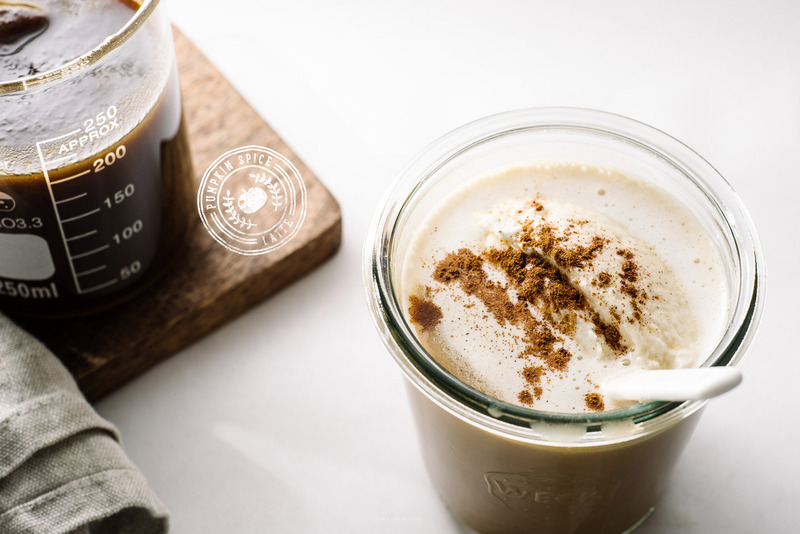 It tastes almost exactly like the one from Starbucks, but better :) This recipe inspires me to create more wonderful treats for friends and family. I am one of your younger followers, but an avid one. Thank you for continuing to inspire me to create tasty snacks. I really like how unique this post was. This drink is different because it has a new flavor that i’ve never tried. It’s easy to make at home, and very tasty. I love your blog and posts! you can go ahead and use freshly cooked pumpkin as well! I grew up with lots of pumpkin in Vermont, and I have always loved it in its many forms. I remember a fantastic homemade pumpkin spice ice cream the most from that time…This seems like a really great idea, and somehow satisfying without having to go to Starbucks and all! pumpkin and espresso really do go well together. I would say up to week – it might be okay longer, but it’s never lasted that long around here! Thankfully there’s no actual pumpkin in Starb*’s version – I can’t stand fruit in my coffee :D but I practically live on pumpkin-spice lattes in the winter. I’m glad for your recipe, though; since I never learned to make pumpkin pie, I never remember what spices to put in! If I leave out the pumpkin, this should be perfect! Just tried your pumpkin spice syrup recipe and added it to some soy milk. It was really tasty! I don’t have brown sugar so I substituted the dark brown sugar for an additional 1/4 c. white sugar and 1 tbsp molasses. Tasty! Thank you! How long do you think this syrup will stay good for (when refrigerated)? i imagine it would last quite a while due to the sugar content – maybe two weeks? 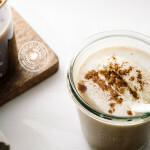 I would love to try the Copycat Starbucks Pumpkin Spice Latte Syrup Recipe, how long does it last for in the fridge? hi dawn, it should last for a week!